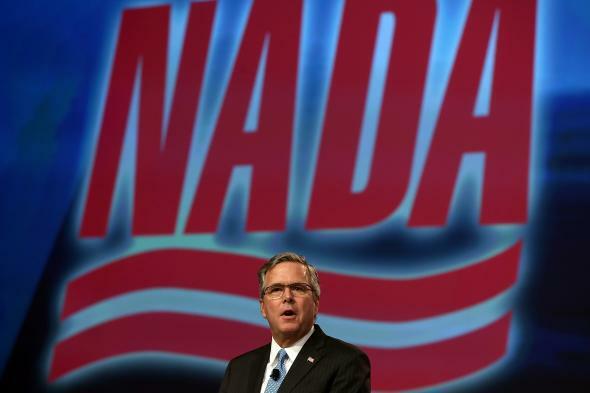 Jeb Bush tells Union Leader Americans need to work more then clarifies. Jeb Bush has an economic plan. During this interview, Bush, while discussing the American economy and his plan to give it a PED-like boost, grabbed what we’ll call the fourth rail of American politics and told Americans they need to work harder. A small price to pay in the name of sweet, sweet 4 percent growth. Are you with me? Eek. Telling the American people they need to work harder is an untested political campaign strategy—presumably for good reason. Jeb Bush, perhaps sensing people weren’t as into the 4-percent or bust plan as he thought, clarified later in the day, telling reporters not everyone needs to work more. “If we’re going to grow the economy people need to stop being part-time workers, they need to be having access to greater opportunities to work,” Bush said. Whew. This talking point might need a bit of fine-tuning.